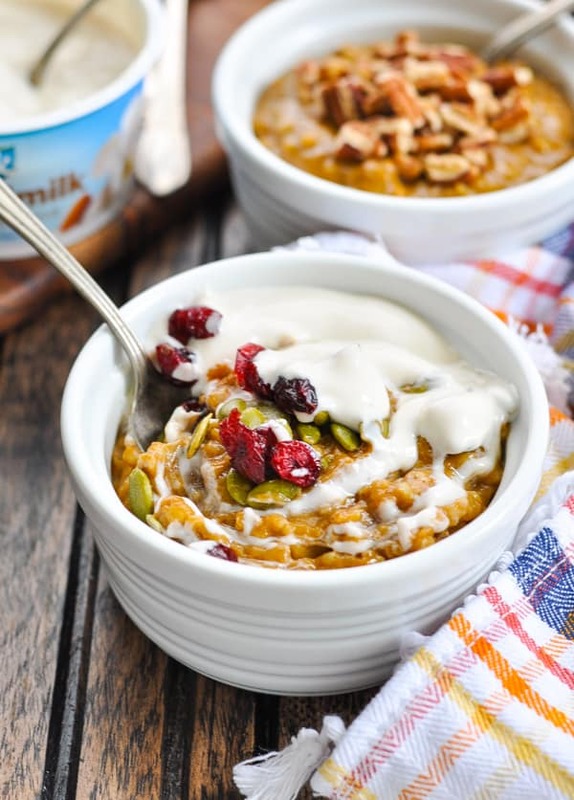 ​​​​​​​Cozy up with a warm bowl of Pumpkin Spice Slow Cooker Oatmeal! This easy breakfast recipe is the perfect way to prep your meals for the week ahead, or a simple fall brunch to feed a crowd -- and it only requires about 5 minutes of prep! 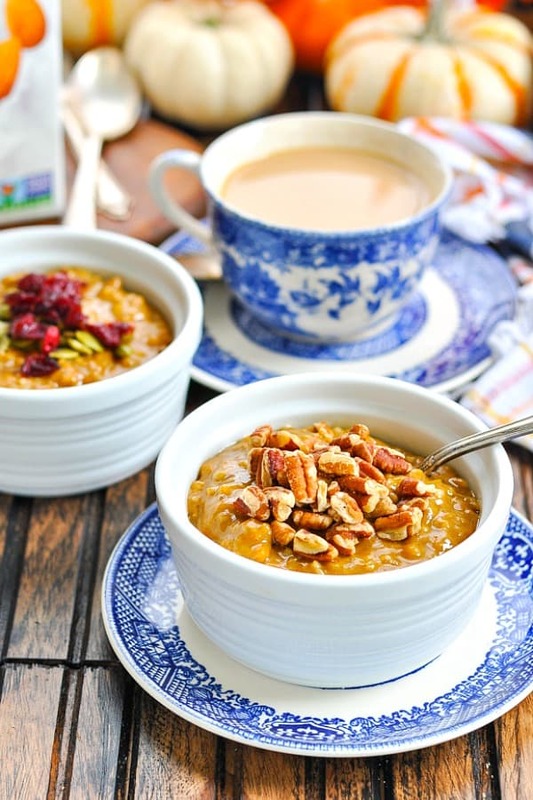 Cozy up with a warm bowl of Pumpkin Spice Slow Cooker Oatmeal! This easy breakfast recipe is the perfect way to prep your meals for the week ahead, or a simple fall brunch to feed a crowd — and it only requires about 5 minutes of prep! 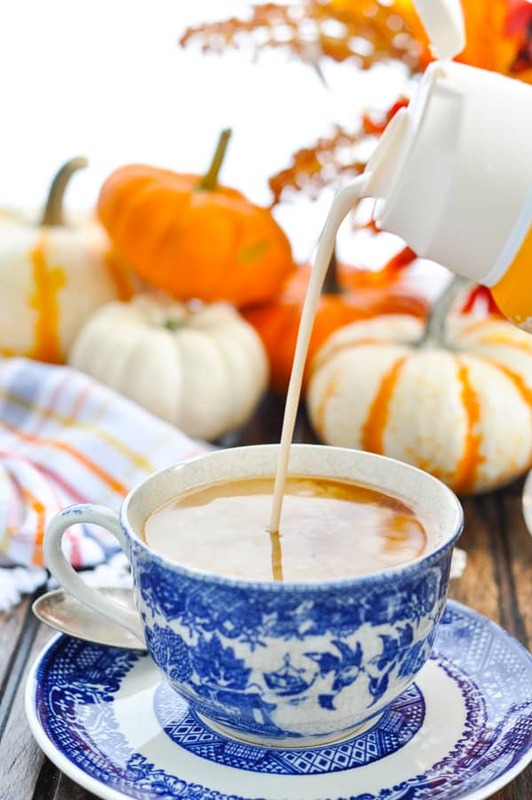 Fall is here — and it’s definitely my favorite season (not just because of the Pumpkin Spice Latte, although that certainly helps)! The crisp, cool air, Virginia’s beautiful changing leaves, and that autumn glow makes this the most wonderful time of the year. 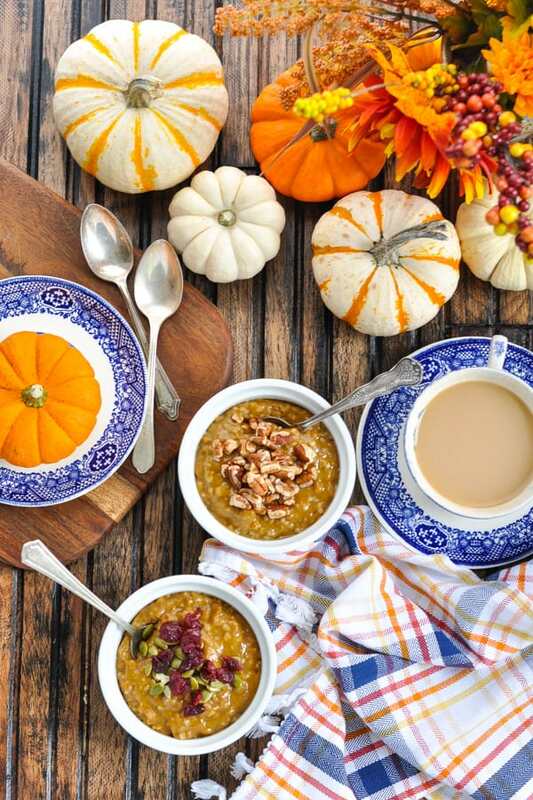 I can’t think of a more appropriate way to embrace the season than a fragrant, spiced bowl of festive slow cooker pumpkin oatmeal! Whether you’re vegan, vegetarian, or just looking to get more plants into your diet, this recipe is a convenient way to nourish your body in a delicious way! While Spence was in preschool for the morning (and my other boys were in school as well), I made a trip to Target last week to stock up on some of our favorites. 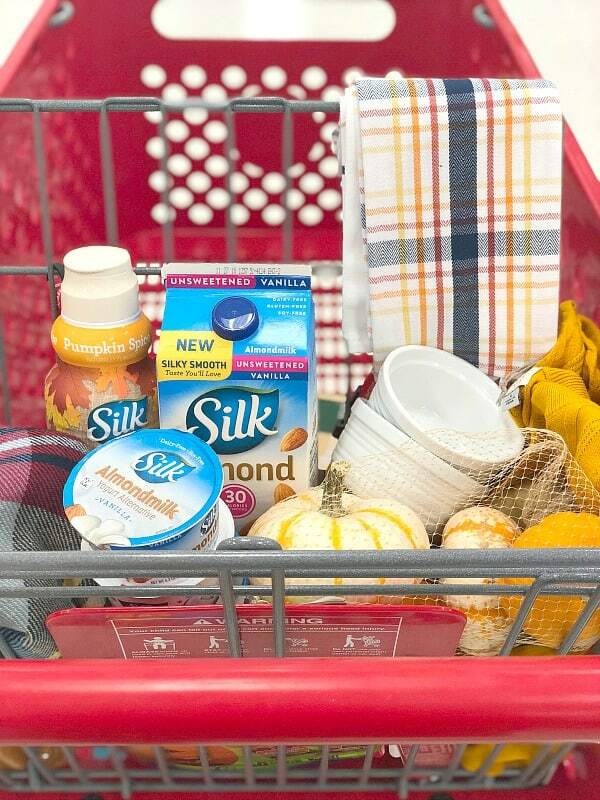 I went with a list in hand, but (as usual) I came home with a cart full of additional fall must-haves! I picked up all of the ingredients for this vegan slow cooker oatmeal, but I also managed to find new dish towels, bowls, a blanket scarf, Halloween candy, fall-flavored coffee, and a mustard yellow cable knit sweater that I just couldn’t pass up! How do you make oats in a slow cooker? 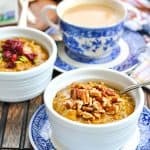 Let me show you how easy it is to prepare dairy-free, plant-based slow cooker oatmeal using almondmilk! Again, you need just a few simple ingredients — all of which you can find at your local Target. First, place steel cut oats, a can of pumpkin puree, maple syrup, and spices in a 6-quart slow cooker. 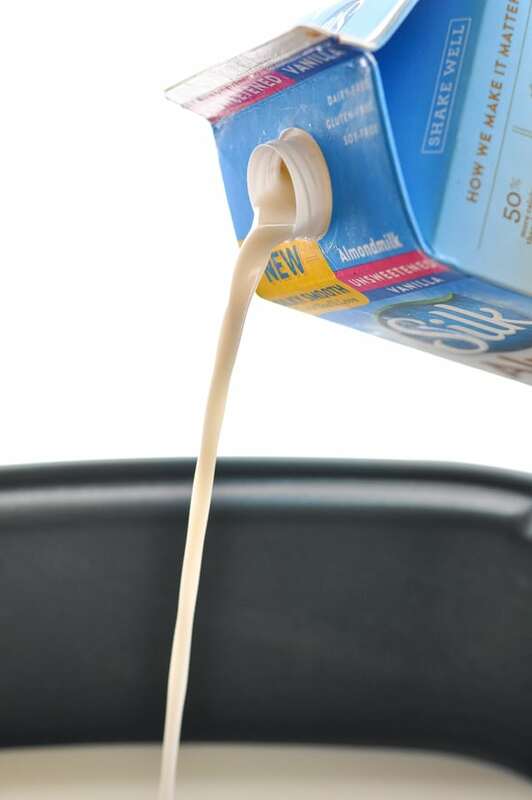 Pour in the liquid: 4 cups of Silk Unsweetened Vanilla Almondmilk and 4 cups of water. I know this looks like a lot of liquid, but trust me — the oats will absorb the liquid and release their starches, resulting in a thick, creamy pot of Crock Pot oatmeal that’s full of plump, chewy oats. It’s amazing how the low and slow cooking process can transform the oats! 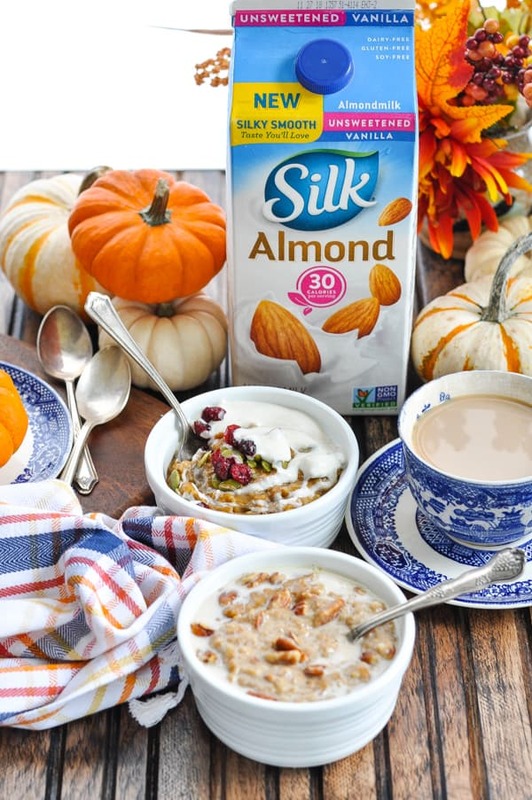 Silk Unsweetened Vanilla Almondmilk also gives the dairy-free oatmeal that creamy texture and a great flavor boost! After 3-4 hours on HIGH or 6-8 hours on LOW, you’ll be greeted by a giant batch of oatmeal in the Crock Pot. I like to prepare the pumpkin oatmeal on Sunday, and then portion it into individual containers to keep in the refrigerator and enjoy for fast breakfasts all week long. It’s meal prep made easy! Quick-cooking microwaveable oats just can’t compete with the thick, rich, creamy texture and flavor. 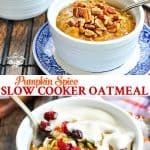 How long does slow cooker oatmeal last? The oatmeal will keep well in an airtight container in your refrigerator for at least 4 days. To reheat, stir in additional almondmilk to reach desired consistency, cover and microwave on high for 1-2 minutes. This recipe is also the perfect slow cooker oatmeal for a crowd! You can set up a beautiful fall brunch buffet, complete with a variety of delicious toppings, and allow all of your guests to customize their bowls. The pumpkin oats are just the base for so many fun, tasty additions! 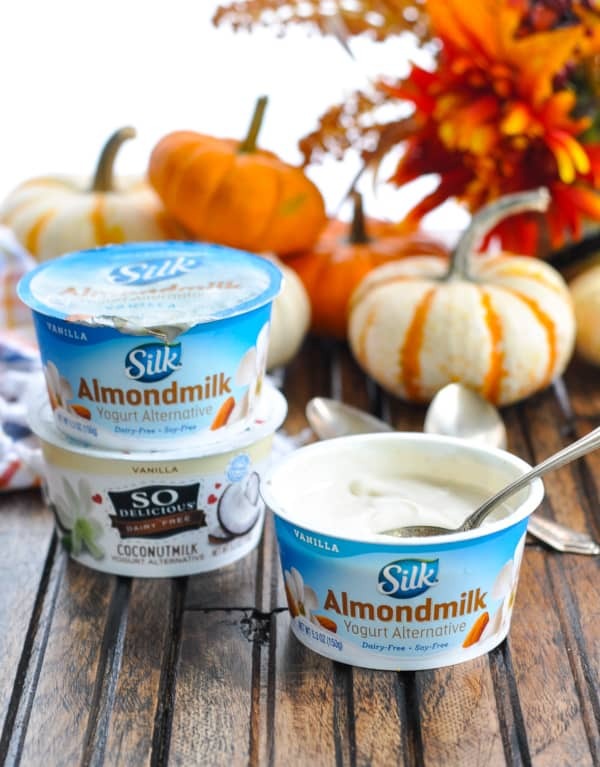 I grabbed these Silk and So Delicious dairy-free yogurt alternatives at Target as well, because they add a nice touch to a warm bowl of oats. Other toppings that I love? Chopped, toasted pecans, dried cranberries, toasted pumpkin seeds, additional maple syrup, and granola. The best bowl of oatmeal includes a combination of crunchy, sweet, salty, and creamy! 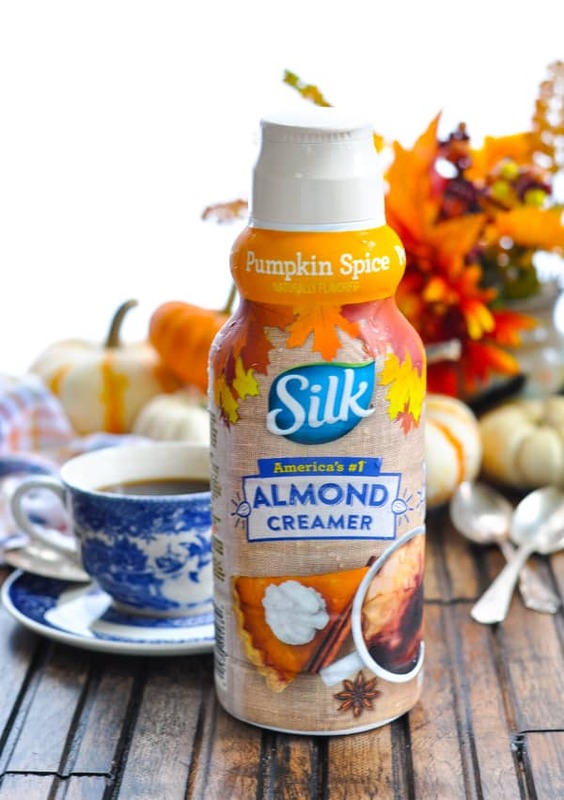 Of course, I also couldn’t pass up the Pumpkin Spice Silk Almond Creamer when I spotted it at Target! but it’s also a nice way to thin the oats. If you’ve cooked the slow cooker oatmeal overnight, you may need to add more almondmilk or liquid in the morning — and this Pumpkin Spice Almond Creamer is the most delicious way to do so!! If you’re home when your oatmeal is in the slow cooker, give it a stir a few times while it’s cooking. If you cook your slow cooker oatmeal overnight, allow the pot to switch to the “warm” setting when it’s done cooking. This will keep the oatmeal warm until you need it, without over-cooking the oats. In my slow cooker, the oats only need about 6 hours on LOW, so I appreciate that “warm” setting while I get a couple more hours of sleep! 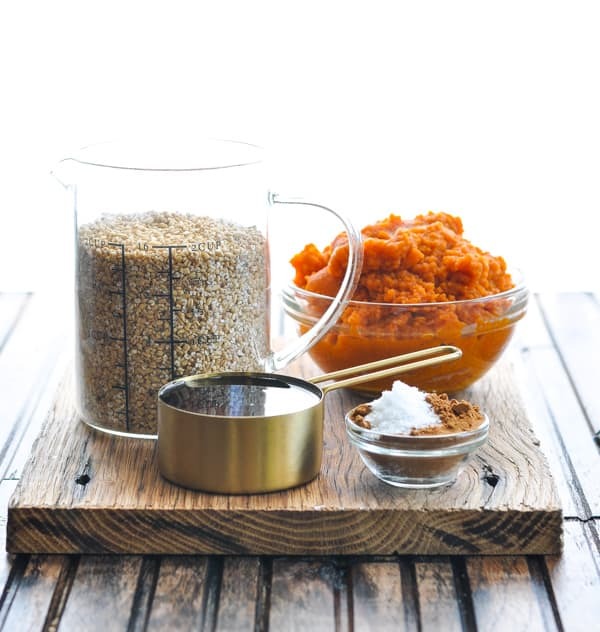 Only use steel cut oats in this recipe! Old fashioned rolled oats or quick oats will get mushy in a slow cooker. Adjust the sweetness and seasoning to suit your taste. This pumpkin oatmeal offers a nice base to appeal to a crowd — it’s not too spicy and it’s not too sweet. That’s why I like to offer additional pumpkin spice or cinnamon and additional maple syrup for guests to stir into their bowls, as needed. Don’t forget the toppings! Some of our favorites include chopped nuts (like pecans, walnuts, or almonds), a drizzle of almond butter, dried cranberries or raisins, shredded coconut, toasted pumpkin seeds, additional maple syrup, yogurt or dairy-free yogurt alternative, and granola. 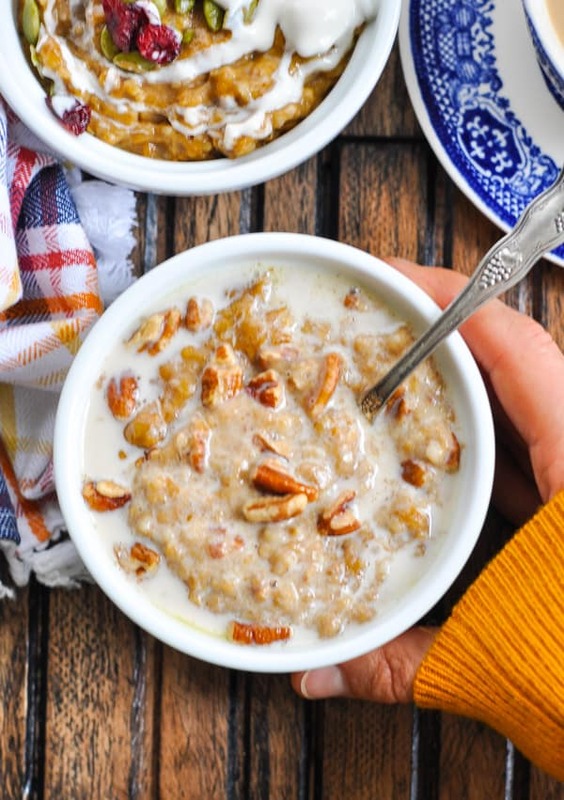 If you’d like to make this slow cooker oatmeal, be sure to download and use the Target app to save 10-15% off on select Silk and So Delicious products between 10/14 – 11/11! Combine all ingredients in slow cooker and whisk to combine. Cover and cook on LOW for 6-8 hours or on HIGH for 3-4 hours, stirring occasionally (if possible). Cooking for a Smaller Family? Cut the ingredients in half to prepare 4 servings. The rest of the cooking instructions remain the same. If you're home when your oatmeal is in the slow cooker, give it a stir a few times while it's cooking. If you cook your slow cooker oatmeal overnight, allow the pot to switch to the "warm" setting when it's done cooking. This will keep the oatmeal warm until you need it, without over-cooking the oats. In my slow cooker, the oats only need about 6 hours on LOW, so I appreciate that "warm" setting while I get a couple more hours of sleep! Adjust the sweetness and seasoning to suit your taste. This pumpkin oatmeal offers a nice base to appeal to a crowd -- it's not too spicy and it's not too sweet. That's why I like to offer additional pumpkin spice or cinnamon and additional maple syrup for guests to stir into their bowls, as needed. Don't forget the toppings! 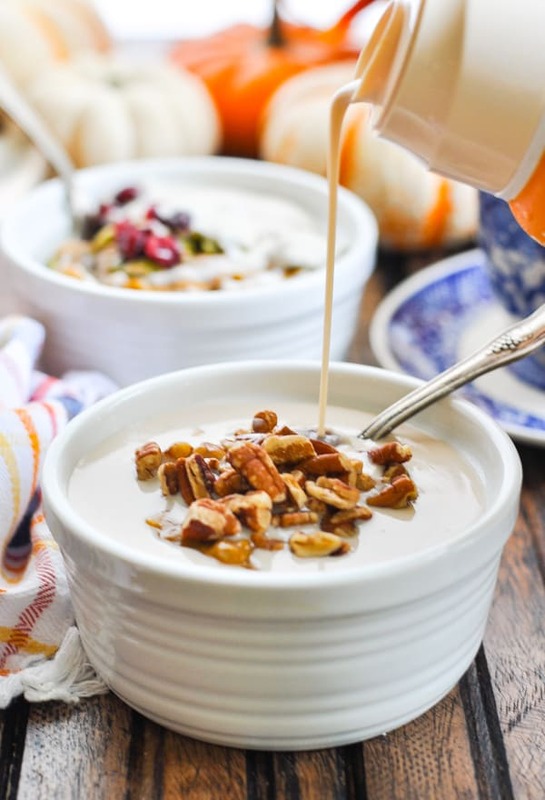 Some of our favorites include chopped nuts (like pecans, walnuts, or almonds), a drizzle of almond butter, dried cranberries or raisins, shredded coconut, toasted pumpkin seeds, additional maple syrup, yogurt or dairy-free yogurt alternative, and granola. I have made this 2x and its absolutely delicious!!! I have also used an apple and pear applesauce with the same spices, but added a little ground clove. It reheats very well, thanks so much!! !